ImageProVision - Started in 2010, ImageProVision is an Image Analytics company. They primarily focus on image processing and detailed analysis. Since Pune Connect 2015, the company has succeeded in growing three-fold with considerable profits. They cater to a wide range of customers in the field of medical sciences, life sciences, chemical and manufacturing industries, as well as agriculture industry. In the last year or so, ImagePro has attracted marquee customers in the pharmaceutical sector too. Co-founder and Director Sandeep Kulkarni said about their experience at PuneConnect, "We had a good experience participating in Pune Connect 2015. We got good exposure to a multi-dimensional group of people. We could also connect with fellow startups and understand their challenges and approaches to handle them. More importantly, we learned the investor's point of view while participating in the selection process of Pune Connect 2015". Trendzlink - Trendzlink is India's first personalised newspaper. It summarises news, curates opinions and blogs, and creates timeline for the stories that readers wish to follow. CEO Aditya Khanwelkar too echoed positive thoughts about the marquee event. 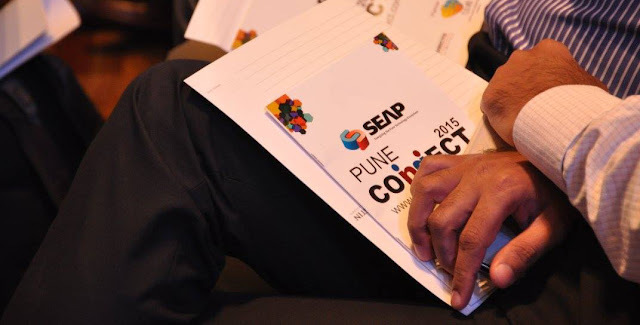 "Pune Connect 2015 platform has definitely benefitted us. In the past one year, we have pivoted from a pure play news aggregator into educational product domain". RoboEasy - This company was started in April 2015 with the idea of making education practical and fun. Using a platform called EduTech, it aims to help students develop logical thinking, enhance decision making, and overall make learning much more practical. RoboEasy's Founder and CEO Aabhas Agarwal opines, "Pune Connect 2015 was a good experience. We learnt how to proceed further, and also understood what exactly the users require". InJarwis Technologies Pvt Ltd - The company has a couple of products, vivifii.com and vivifii.apk for behavioural health care discovery and delivery on mobile or desktop platforms via audio, video, and text channels. According to its Co-founder Paras Pagare, post the exposure at Pune Connect 2015, they have been able to sign up two marquee clients and have been able to generate a good sales pipeline. "The event helped me connect with investors and entrepreneurs who helped us refine our product. We got a good indication of investors' expectations and their interests in our kind of business," he feels. Consequently, the company now plans to expand to other cities in the coming months. Pune Connect has created a name for itself as one of the most sought after stages in Pune for startups and entrepreneurs keen to make a mark for themselves in the industry. Not surprising then that the success stories which have emerged from the previous years, of participating companies, are heartening. They are a reminder of how more good is to come from this forum. Have you registered yet so your story could be in a similar article next year before Pune Connect 2017?